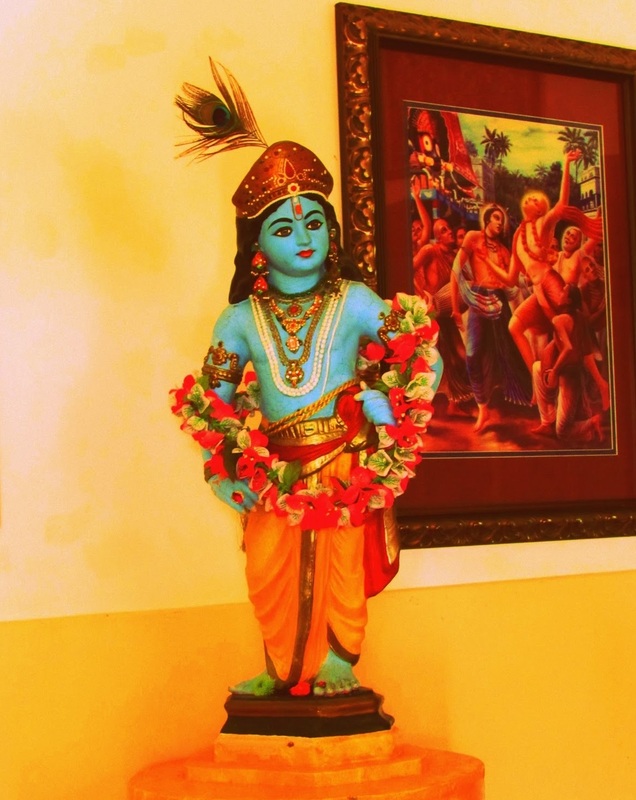 "Hare Krsna. aṅgāni yasya sakalendriya-vṛtti-manti (Bs. 5.32) Aṅgāni means limbs of the body. Govinda, Lord Kṛṣṇa is person. He's got His limbs of the body as we have got. Man is made after God. We are imitation of Kṛṣṇa. Kṛṣṇa is not imitation of us. The atheist class, they think that 'They have painted a form of God according to one's own feature of the body.' What is called? Anthropomorphism. But that is not the fact. Here in this material world we are getting different types of forms of body, 8,400,000's. When we get this human form of body, it is just imitation of Kṛṣṇa's body. Kṛṣṇa has got two hands; we have got two hands. Kṛṣṇa has got two legs; we have got two legs. But the difference of this body and Kṛṣṇa's body is stated in this verse: aṅgāni yasya sakalendriya-vṛtti-manti (Bs. 5.32). Here, with our hands, we can catch something but we cannot walk. But Kṛṣṇa can walk with His hands. Or with our legs we can simply walk, but we cannot catch something. But Kṛṣṇa can catch also. With our eyes we can see, but we cannot eat. But Kṛṣṇa can see with His eyes and eat also and hear also. That is the explanation of this verse. Aṅgāni yasya sakalendriya-vṛtti-manti: 'Each and every limb has got the function of the other limbs.' That is called Absolute. He is not dependent. He is not dependent. Just like if we have lost our sight, we become dependent; no more we can see. But Kṛṣṇa can see with His hand, with His leg. Try to understand. Therefore He is Absolute. This is the meaning of Absolute. Everything is complete. Pūrṇam adaḥ. Pūrṇa means complete. So atheist will say that 'You offer foodstuff. Where Kṛṣṇa eats? The foodstuff is still there.' But they do not know that simply by seeing, Kṛṣṇa can eat. And because He is complete, He eats and again keeps the thing complete. Pūrṇasya pūrṇam ādāya pūrṇam evāvaśiṣyate (Iso Invocation). He can take everything complete, again it remains complete. Just like when we take food, we finish it. No more. But Kṛṣṇa can eat; at the same time, the things may remain as it is. Otherwise where is the difference between ourself and Kṛṣṇa? That is the difference. Why it is so? Ānanda-cinmaya-sad-ujjvala-vigrahasya. Vigraha, His form is not like our form. When in the Vedas it is stated, 'formless,' that means His form is not like our form—not that He is formless. The form is of different quality. These are possible when the body is made of ānanda-cinmaya-rasa. This body is material. It is not ānanda-cinmaya-rasa. The material body is different from the spiritual body. That they do not know. So when the Vedas says nirākāra, 'formless,' that means He has no material form; He has got spiritual form. That spiritual form means full of bliss, ānanda. Ānandamayo 'bhyāsāt (Vedānta-sūtra 1.1.12). Vedānta-sūtra. By nature ānandamaya. There is nothing nirānanda (misery). That is spiritual world, always full of bliss, full of knowledge, and eternity. That is spiritual. You live eternally and full of knowledge. Here so many things we do not know. It is full of ignorance, this body, and full of miseries. Moment after moment, we are, due to this body, we are always in miserable condition, threefold miseries—adhyātmika, adhibhautika... So people do not try to understand this philosophy, but in the Vedic literature, each and every line, there is philosophy. Ānanda-cinmaya-rasa-pratibhāvitā. So this is understanding of Kṛṣṇa. When Kṛṣṇa says that janma karma me divyam (BG 4.9), 'My appearance, disappearance, and activities, they are all transcendental,' so how it is transcendental? Because His body is different from us. The bodily limbs are different from us. The activities of the body are different from us. And because He is full with all potency, in spite of all these transcendental qualities, He can present Himself as one of us. And those who are rascals, they think that 'Kṛṣṇa is like us.' Because He presents Himself as one of us by His omnipotency, the fools take him as one of us. Avajānanti māṁ mūḍhā (BG. 9.11). Muḍḥā means rascals, foolish people. Paraṁ bhāvam ajānantaḥ: 'They do not know the transcendental nature of Me.' This is transcendental nature, aṅgāni yasya sakalendriya-vṛtti. This is explained by Brahmā. Brahma-saṁhitā means... Brahmā is the first living creature appeared in this universe, and after his realization, he is offering prayer. Realization means you should write, every one of you, what is your realization. What for this Back to Godhead is? You write your realization, what you have realized about Kṛṣṇa. That is required. It is not passive. Always you should be active. Whenever you find time, you write. Never mind, two lines, four lines, but you write your realization. Śravaṇaṁ kīrtanam, writing or offering prayers, glories. This is one of the function of the Vaiṣṇava. You are hearing, but you have to write also. Then write means smaraṇam, remembering what you have heard from your spiritual master, from the scripture. Śravaṇaṁ kīrtanaṁ viṣṇoḥ: (SB 7.5.23) about Viṣṇu, not for others. Don't write any nonsense thing for any nonsense man. Useless waste of time. Viṣṇu. Write about Viṣṇu, Kṛṣṇa. This is cultivation of Kṛṣṇa consciousness. Hear, write, remember, try to understand. Don't be dull, dull-headed. Very intelligent. Without being very intelligent, nobody can have full Kṛṣṇa consciousness. It is for the most intelligent man. So that intelligence will come if you try to understand Kṛṣṇa. We have got so many books. Always try to understand Kṛṣṇa. Then you are liberated. Simply by... You cannot understand Kṛṣṇa in full. He is unlimited; our knowledge is limited. But as far as you can, try to understand Kṛṣṇa. These are the items. Aṅgāni yasya sakalendriya-vṛtti-manti (Bs. 5.32). Veṇuṁ kvaṇantam aravinda-dalāyatākṣam (Bs. 5.30). He is engaged in playing on flute. It is not artists' painting that Kṛṣṇa is painted as a very nice, beautiful young boy and He has got a flute. No. These are Vedic statement.